Latest Generation 6 mini excavators feature major advancements for greater returns - Kobelco Construction Machinery Europe B.V.
Kobelco’s all-new Generation 6 excavators may be small, but the specialist earthmoving and construction machines deliver big savings when it comes to operating costs. The SK35SR-6 and SK30SR-6 deliver high performance with exceptional fuel economy, and are set to be class leaders in the in the 3-4 tonne category. New attributes will also feature on the new SK28SR-6, which will replace the SK27SR-5 model. The host of new features includes improved lifting capabilities, arm crowding and bucket digging force, more than 100% increase in fuel capacity and increased engine performance. The latest mini excavators, which are powered by powerful Yanmar (3TNV82) engines, are ideal for general purpose construction and landscaping projects and offer a dramatic reduction in fuel consumption over dash-5 models. For example, fuel consumption is reduced by a remarkable 25% in S-mode, while a 15% decrease can be realised in H-mode. In addition, a new hydraulic system utilising the third pump, which was previously used only for dozer blade and swing operation, directs additional power to the boom and arm circuit. This ensures fast and smooth operation, even under heavy loads, and results in greater fuel savings for the customer. 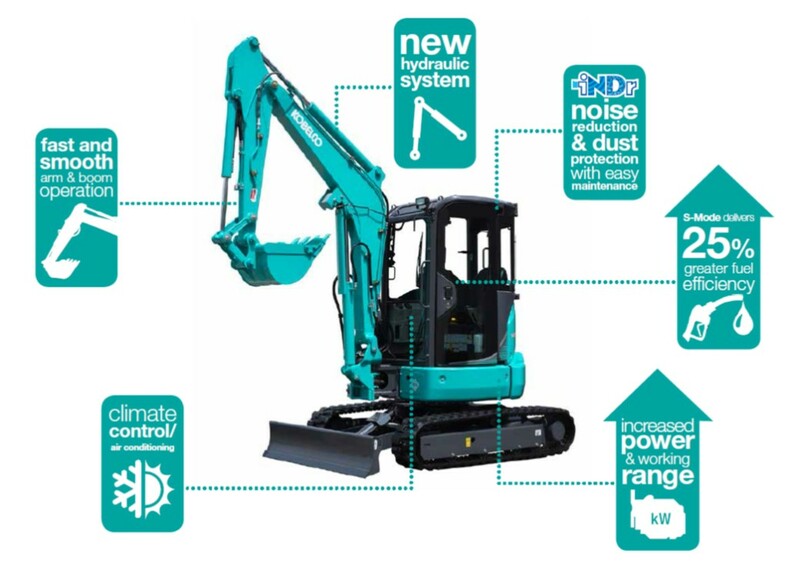 The Generation 6 models also feature Kobelco’s Integrated Noise and Dust Reduction Cooling System (iNDr) – a first for the mini excavator range. This system enables easy access to the air filter, which is now mounted in front of the radiator system, prevents damaging the radiator during cleaning and reduces downtime for day-to-day maintenance. Use of innovative iNDr technology also contributes to a decrease in machine noise for greater operator comfort.A reduction of around 7 dB over the previous equivalent models has been achieved with the latest Generation 6 machines, which is an important consideration for urban and residential job sites. 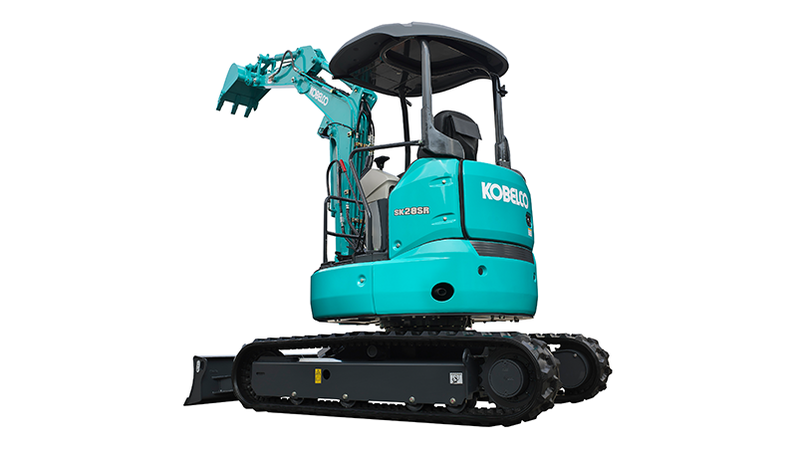 Kobelco understands that comfort and safety are all-important considerations in machine operation and purchase, and as a consequence have made significant updates to the SK-6 machines when compared to the dash 5 models. While the canopy version is still available, air conditioning now comes as standard on all Generation 6 machines with ROPS-compliant cabins. The unit is sited to ensure increased operator visibility to the rear and right of the machines. Other improvements to aid operator comfort include a reclining operator chair* with mechanical suspension and a one-touch decelerator button on the operation lever. The radio entertainment system is USB, AUX and Bluetooth-enabled, which increases operator comfort over long hours of work. In addition, optional multi-display cabin monitors are available for checking operational data and machine diagnostics, ensuring work continuity. Generation 6 machines SK30SR-6 and SK35SR-6 are now available from authorised dealers across Europe. The Kobelco SK28SR-6 will start to arrive in Europe in April.